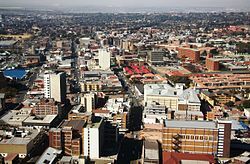 This article is about the city in South Africa. For the district of Glasgow, Scotland, see Germiston, Glasgow. It was established in the early days of the gold rush when two prospectors, John Jack from the farm of Germiston near Glasgow and August Simmer from Vacha in Germany, struck paydirt on the farm of Elandsfontein. In August 1887, the pair were on their way to the Eastern Transvaal when they outspanned (rest the pack animals) on the farm Elandsfontein and decided to stay and buy the land. :285 Both men made fortunes and the town sprang up 2 km from the Simmer and Jack mine named after Jack's fathers farm. :285 In 1921 the world's largest gold refinery, the Rand Refinery, was established at Germiston. Seventy percent of the western world's gold passes through this refinery. Although gold mining gradually wound down in Germiston, to the point that by the end of the 20th century it was no longer a mining centre, the Rand Refinery remains as busy as ever. The city has a number of historic buildings. Among these are the St Andrew's Presbyterian Church which was built in 1905, and St Boniface Church designed by Sir Herbert Baker, which was built in 1910 (this is the second church on the site, as the Anglican Parish was founded in 1897). The church also houses the historic 1910 English Romantic Norman and Beard Organ. The Alexander Hotel was also partly designed by Baker, using his traditional stone appearance. This building has recently been completely renovated and now houses a well-known law firm. The builder of the hotel, Alexander Stuart, some of whose descendants still live in Germiston, died when the RMS Lusitania was torpedoed in the First World War on 7 May 1915. The hotel thus remains a memorial to his pioneer work in the city over a hundred years ago. The WesBank Raceway motorsports facility was located in the city, but it was sold to industrial estate developers in November 2007. The Raceway was formerly the Gosforth Park Race Club, one of the major horse racing facilities in Gauteng. Germiston Stadium (formerly the Herman Immelman Stadium), home stadium of Moroka Swallows FC is also located in the city. This is also the home ground for the Germiston Simmer Rugby Club and has a tartan track for athletics. By 1931, the Germiston municipality had assumed a pseudo-heraldic coat of arms, depicting (1) buck in the veld, (2) a scene showing mineshafts, (3) a railway train in a landscape, and (4) a half-tented ox-wagon in a landscape, the quarters separated by a red cross. The motto was Salus populi suprema lex. A proper coat of arms was granted by the College of Arms in August 1935. It was registered with the Transvaal Provincial Administration in August 1963 and at the Bureau of Heraldry in February 1968. The arms were: Gules, within two bendlets Or between two ox wagons Argent, three bezants (i.e. a red shield displaying three gold coins between two diagonal gold lines between two ox-wagons). The crest was a rising falcon (representing Rand Airport); the supporters were two eland, each resting a foot on an heraldic fountain (a white and blue striped disc); the motto was Salus populi suprema lex. 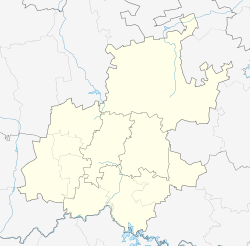 Germiston is well connected to five mayor freeways or motorways that service the Greater Johannesburg region. 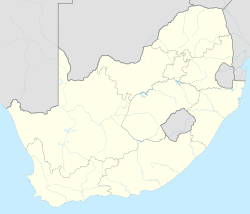 These include to the west of Germiston, the M2 motorway that connects the southern Johannesburg CBD, the N3 Eastern Bypass, the N12 South. On the southern side, the N17 and N3 and in the north, the N12 East and the R24 service the city. Being a mining and industrial city, Germiston is serviced by passenger rail and the CBD has several stations, the main one being Germiston Station. The industrial areas are service by rail spurs and stations and the Transnet has a large depot north of the CBD in Keswick Road. Germiston is served by the Bertha Gxowa Hospital, a public state hospital. Other private hospitals include Life Roseacres Hospital in Primrose. There are a number of schools in the city; primary schools include Colin Mann School and Germiston South Primary School, high schools include Germiston High School (founded 1917) and Afrikaans Hoër Germiston. The oldest high school in the city is part of the combined St Catherine's School, a Catholic school which was founded by the Dominican Sisters under the leadership of Mother Rose Nyland in the city centre in 1908, and then relocated to Piercy Avenue in the suburb of Parkhill Gardens in the 1940s. Germiston High School was founded alongside Victoria Lake; from the 1940s to 1963, the girls were based in Fourth Avenue in Lambton, at what was known as Germiston Girls' High School, whilst the boys remained at the 1917 campus as Germiston Boys' High School. In 1964, due to the need to relocate the Afrikaans Delville Primary School, the girls were moved back to combine with the boys in the original historic buildings. Famous past pupils include Dr Sydney Brenner, winner of the 2002 Nobel Prize. The Germiston Boys' High School cadet band was known throughout South Africa as one of the greatest school cadet bands ever to compete and parade in South Africa. This cadet band's record of achievement is unparalleled in the history of South African school cadet bands. The band started its success from the year 1952, running up to and including 1964. Often the band would record an average mark of 99 percent overall. (Music performance, drumming, bugle and trumpet ensemble, along with drill, dress and discipline). The school boasted a very large and active music centre for a number of years, which grew largely due to the work of the late George Burgess. The various jazz and concert bands that were the product of the music centre recorded various long playing records, won awards in various Eisteddfods and national competitions and appeared on television. Sadly, due to education department budget restructuring, the music centre was closed. The school still enjoys the singing of an excellent choir. The rowing club, which won the South African National Championships in 1980, is still flourishing, and the oarsmen and women compete at all the school regattas. Jeannie de Gouveia (better known as Jeannie D), TV presenter, media personality, founder of Finery Gin. Ernie Els, golfer who attended Delville Primary School and Jan de Klerk High School. ^ a b c d "Main Place Germiston". Census 2011. ^ a b Conolly, Denis (1975). The Tourist in South Africa. Travel-Guide (PTY) LTD. ASIN B0000E7XZN. ^ "Main Place 'Germiston'". Census 2001. Retrieved 18 April 2011. ^ Transvaal Official Gazette 2400 (19 August 1963). ^ "Bertha Gxowa Hospital". Gauteng Provincial Government. Retrieved 10 June 2018. ^ "Life Roseacres Hospital". Life Health Care. Retrieved 10 June 2018.